Wellington students utilised prezzi technology to raise awareness to their peers of Hutt valley rivers. The students involvement in PTC's indigenous Sparks™ program was part of a wider initiative that began in Term 3 2016 called the Hutt valley restoration program. In association with Wellington City council the year 10 cohort of Taita College planted 800 native trees over the course of the year to protect the area around Taita rocks. This 3 year commitment will track the same group of students over time in order to ensure these trees are growing well, the area is well weeded, fertilisers and mulch are added as and when needed. As a part of this ongoing project the students get an opportunity to write NCEA level 2 standards in Education for sustainability. Armed with the science learning gained from PTC's Microbial labs at Victoria University students organised the school assembly presentations before a school roll of 470 students. Kawerau students also attempted to capture their experiences of river engagement through animations. Youths utilised their own blog page to share their learnings, communicate science and raise awareness to their peers. One of the key messages is the ways in which living things need the right conditions to reproduce successfully and maintain sustainable levels. Throughout their engagement with scientists, Universities and technologists students were shown how Māori traditions and Western science can work together to preserve populations that may be at risk. It was an exciting development opportunity to see express their learnings in their native tongue. 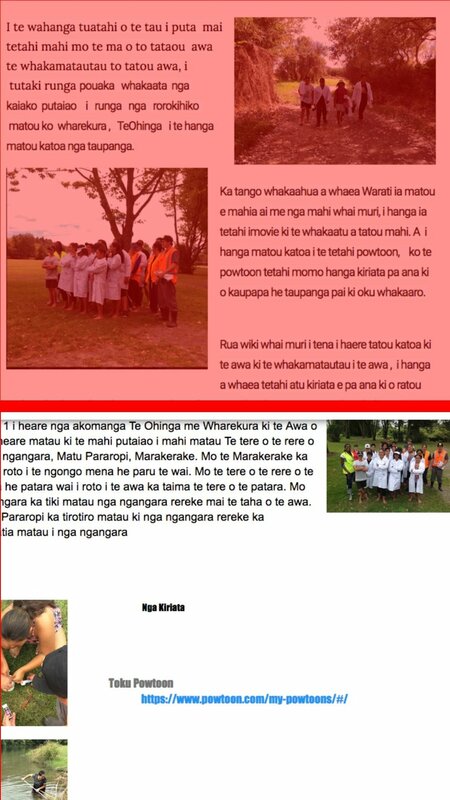 Te reo Māori and tikanga Māori are intertwined, and so learning te reo Māori has given students access to te ao Māori (the Māori world) and to Māori world views. The insights and experiences that students gain as they integrated Western science whilst learning their language has enriched and broadened their understandings of the uniqueness and complexity of te ao Māori. Teams of rangatahi producing animations around the ecology of the Tarawera river. Students noted that the waters in the upper reach of Tarawera River is generally of a high quality, but waters in the lower reach were not as clear. Tarawera River Catchment - Review Summary Report indicates that 'industrial discharges or diffuse stormwater inputs from Kawerau township, this has had a major impact on the invertebrate communities supported in the Lower Reach of the Tarawera River. Despite this, the communities recorded at Kawerau are typical of clean water conditions, being dominated by species of mayfly, caddisfly and midge larvae'.